High quality standards and friendly customer services: 2-year-warranty and 90-day-refund guarantee. If you have any question or get defective lights, please contact our customer service center, we will give the solution within 24 hours. Remote controller included, dimming, color changing, timing, memory, sync. Warm white with 16 high-lumen LED chips, 2700K, CRI>85, 950LM, 75W equivalent , 270-degree, to meet the general lighting. 10 popular colors, and 6 modes (Flash, Strobe, Smooth, Warm, Fresh, Romantic). work with a variety of shades to decorate the hall,Living room or bedroom,etc, create a romantic and warm atmosphere. 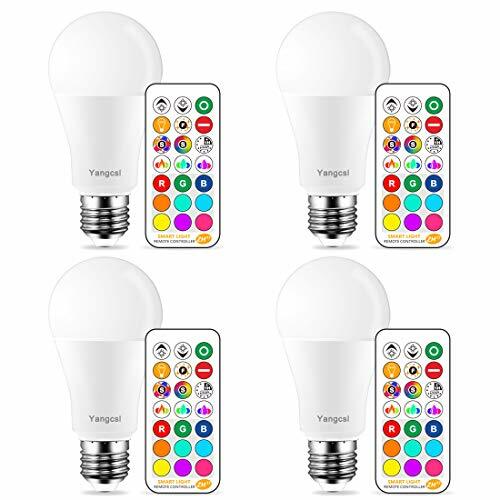 Turn off the power and turn it on again, the led bulb will remember the color or mode that was last used. It is ideal for lamps (such as fan lights, downlights, chandeliers, etc.) used with multiple light bulbs. When we use dynamic mode, the rhythm of the color change of the led bulb can be consistent. No need to connect a timer, after setting, it will automatically turn on and off every day (24 hours for 1 cycle).